SIMUL8 is a business simulation system displaying fast moving graphics and calculating complex numerical measures of performance of business scenarios. Process throughput is typically increased by over 20% by people who use SIMUL8 simulations, so it is very important to your users. SIMUL8 NLS manages the sharing of licenses so that any user on your network can have access to SIMUL8, but the organization will not exceed the purchased number of licenses. It is a concurrent licensing system. SIMUL8 is also available as non-networked (non-concurrent) editions and also as a networked concurrent system using alternative management systems (such as Flex/FlexNET/FlexLM). This document does NOT relate to FLEX related implementations – please consult our sales department if you would prefer to use a FLEX based concurrent licensing system. SIMUL8 Network License Server editions allow SIMUL8 to be installed on an unlimited number of computers/users within your organization. When any individual user or computer tries to start SIMUL8 the central license server is contacted and a license obtained (if sufficient licenses are available at that time). If insufficient licenses are available at that time, a message is displayed and SIMUL8 does not start. The user will need to wait until licenses become available. SIMUL8 Network License Server editions allows users/computers to “check out” (sometimes called “borrow” or “roam”) away from the network. For example they may need to do this when using SIMUL8 on a laptop at a client office where network access is unavailable. Licenses that have been taken away from the network need to be “checked in” before they can be used by other users. Administrators can force back lost licenses. This edition of SIMUL8 NLS uses a LAN based file server to manage licenses, making it quick and easy to install and maintain. Any type of file server can be used. 6. Have each user machine run the client installer (in a folder under the shared location) – this can be automated via a deployment method if required. 8. You can optionally review usage of SIMUL8 and return lost users. If you are experienced with network based installations the above summary may be all you need to follow the on-screen prompts – however more details are provided below. If you need support during this process please use our help/support management system via support@SIMUL8.com (or call a number that relates to your location – see our web site for numbers). Please make it clear you are installing a SIMUL8 Network License Server (SIMUL8 NLS) to get your support question to the most appropriate people in our team. Save this license file to a folder you will be able to access during the install of the server side software. DO NOT save these files into the folder you intend to use as the destination of the install on your server. If you have a past install of any release of SIMUL8 do not attempt to use the license files in that installation – the license files in installations are converted during the installation process. Always use the file emailed. Select a machine to use as the Network License Server (The NLS machine). It can be a very simple machine with little power. Very little bandwidth is required. An existing fileserver is usually appropriate. SIMUL8 Corp has tested a wide variety of file servers and all have worked well. The machine will not be running any software. It will simply host files that are accessed by the client machines. The machine needs to be accessible from every network location where your users will use SIMUL8 (except that users are permitted to check-out from the network and use SIMUL8 unconnected if, for example, they will be working away from the office at a location without network access). Run the installer, NLS_SIMUL8.EXE, (with Admin rights). This will install the Network License Server for SIMUL8 into the shared area on the server machine. You can run the installer from any machine that can access the shared area with full rights. The installer will create a folder structure – do not modify this structure. • Follow on screen prompts. 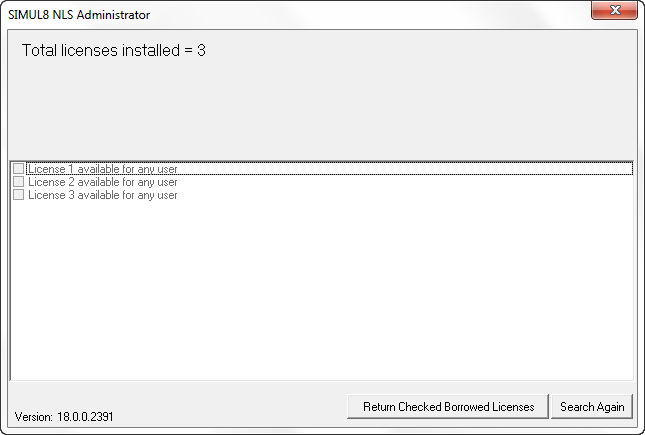 Note that when running the CLIENTSETUP installer, the license number field will automatically populate if setup correctly. Do not change this license number. Your users do not require admin rights to run SIMUL8. Users start SIMUL8 via the desktop icon created during step 7. The SIMUL8 NLS management is transparent to the end user unless there are too few licenses available, or they wish to work away from the network. Users can then close and open SIMUL8 and make any use of it, without reference to the network license server. Steps 1 – 7 get you up and running. This final step contains other useful notes that you might want to use after installation and confirming your clients are up and running. This allows you to see how many licenses are in use, who has “checked out” (roamed) licenses, and to force a return of a checked out license if a client machine has broken while in checked-out state.